I fell in love with this garland from Antrhopologie in December. I had some leftover pom-poms from the Christmas tree, so I decided to add a few more and make my own garland! It’s actually super easy, just takes a little time. I made pom-poms at night by the fire while watching hockey games with my son. That’s a win-win right there! 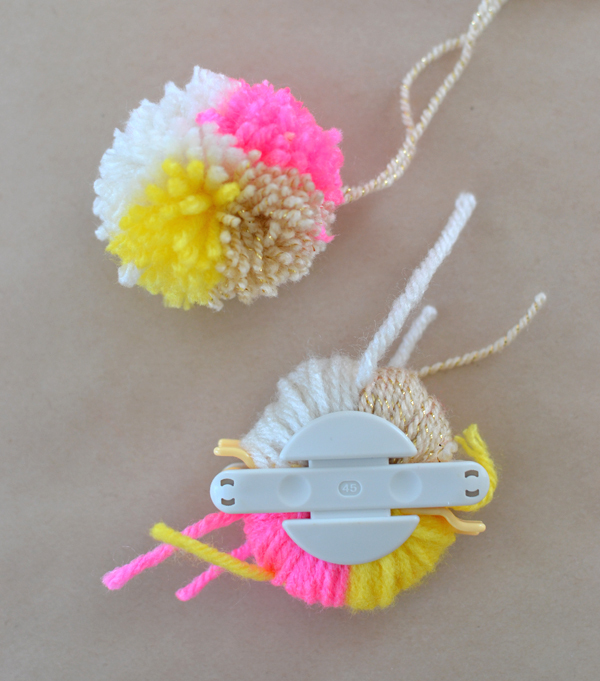 Have you ever seen these pom-pom makers ? 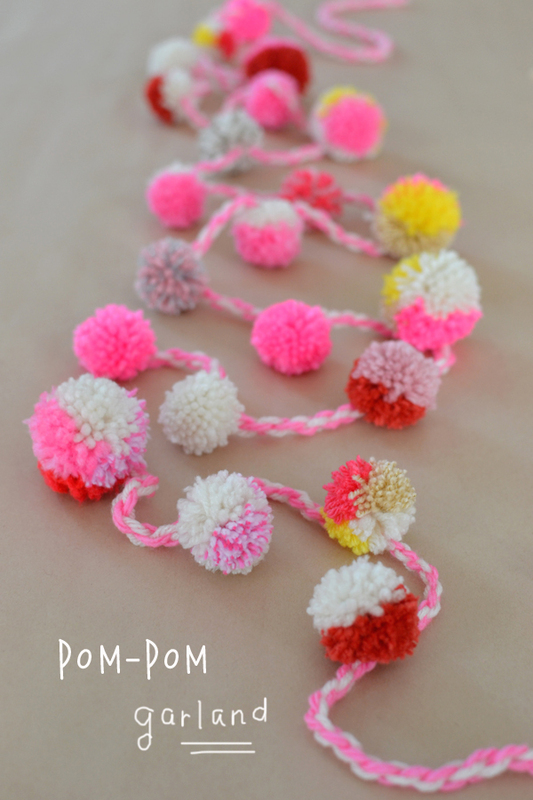 They make pom-pom making sooo incredibly easy it’s insane! 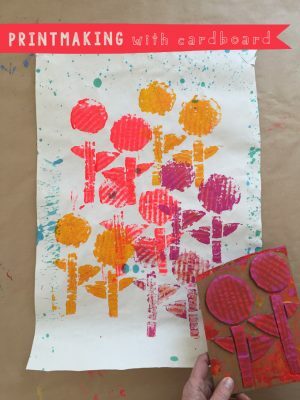 Here is a great tutorial on how to use them. I used the smallest two sizes. The only other supplies you need are yarn (I get mine at Michael’s) and some good, sharp scissors . 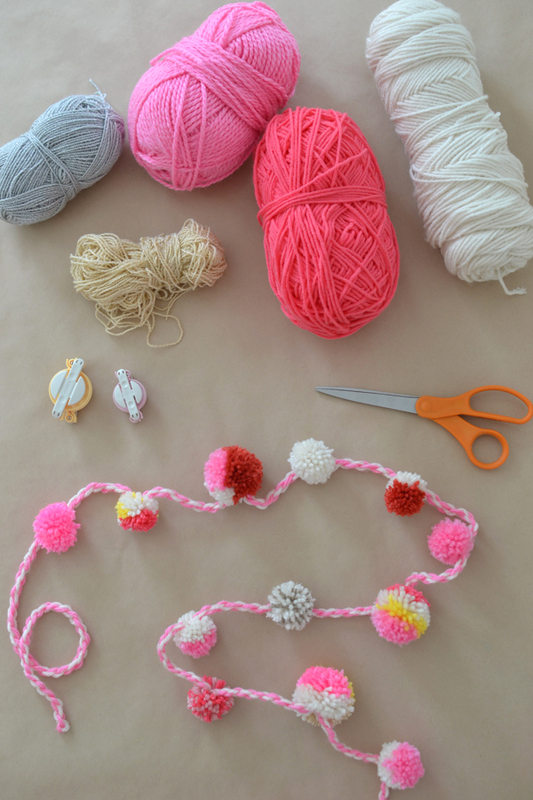 ~ Start by making 24 pom-poms in all different colors and sizes. 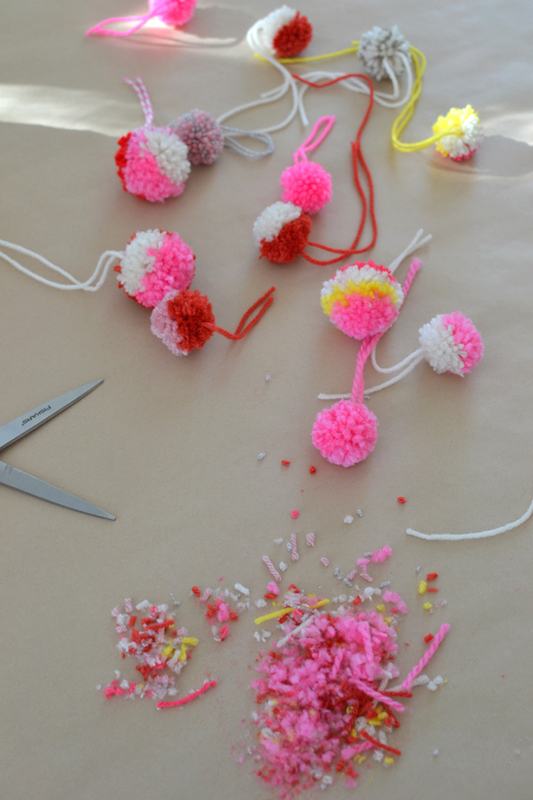 Again, I used the two smallest size pom-pom makers. 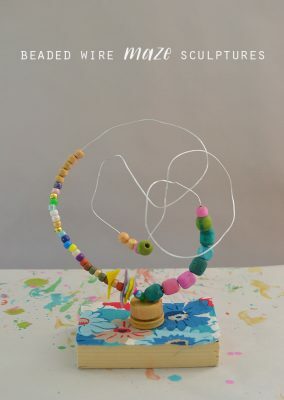 I made some of my pom-poms solid and others I made multi-colored (those are the most fun!). 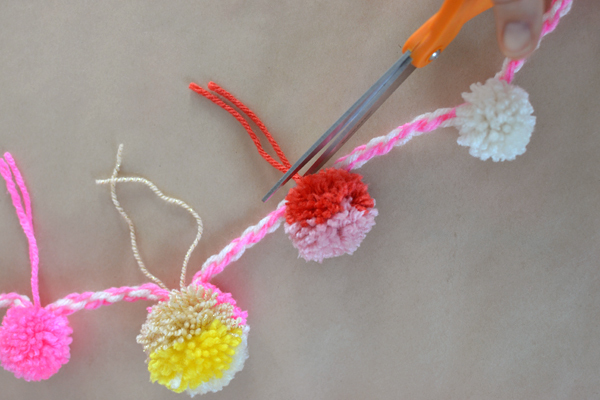 ~ Leave the stem long on the pom-poms (the string you use to tie the pom-pom together). ~ When all of the pom-poms are made, it’s time to make your roping. I made mine 6 feet long. Click here to find out how to make this quick-and-easy roping. 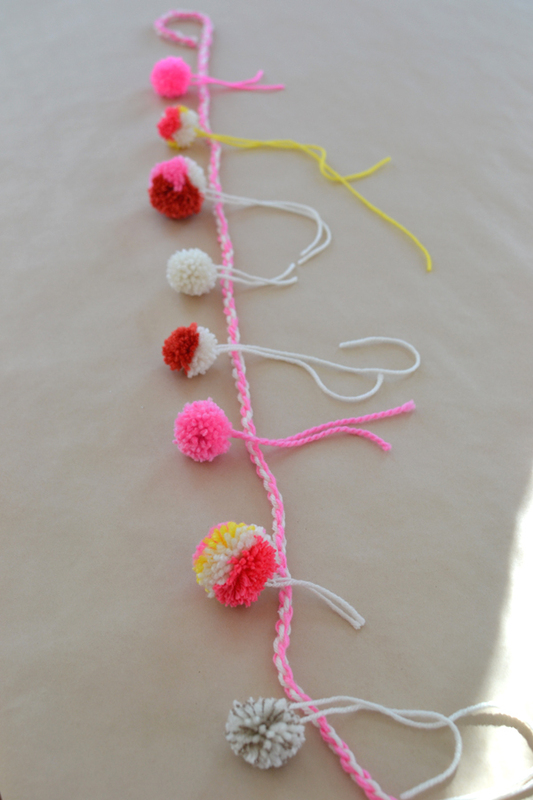 ~ Lay out your pom-poms in the order you like. Then tie them to the roping. Trim the stems. Now you’re done! I’m really in love with this garland, it’s just so happy and colorful! I’m going to make a few more for a pop-up shop I’m part of in March. Right now I’m working on a blue/green version (and it’s quite good looking). Next week I’ll be on vacation with my family so I’m taking some time off. We are traveling to a beautiful, sunny destination for my dad’s 75th birthday. 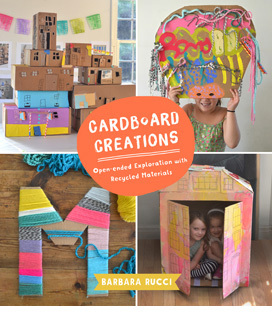 Follow me on Instagram to find out where we are going (and to see photos of all of the cool stuff I’m making at home and with my 4-yr old art students). 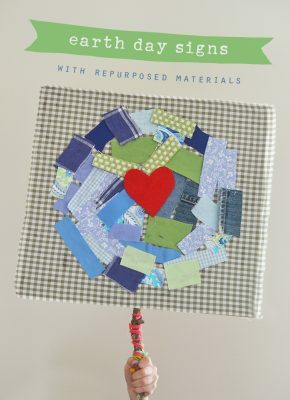 Great idea — I’m going to make one for my tabletop Christmas tree either all read or red and white. I’d long ago forgotten all about that easy, braided rope you linked to, how to make it, and am grateful that I found this garland on Pinterest to remind me. 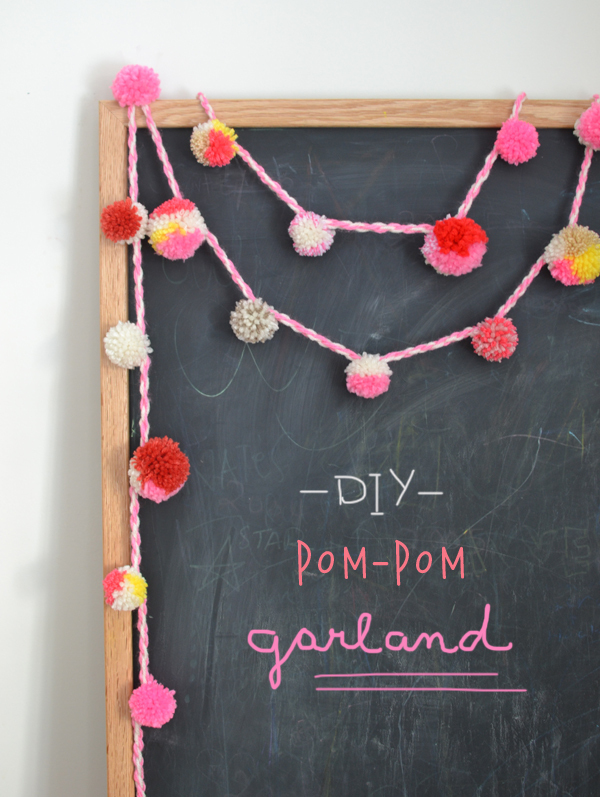 I’d been looking for something I liked other than just a strand of yarn to tie the pompoms to.